Factor’s large resin storage sheds close the door on conserving in preference for an easygoing clean. This 11 footer’s weatherproof design empties a garage with ease meanwhile an occasional light pressure-wash conveniently revives appearances. Factor range of sheds receive upbeat reviews across the globe. There’s no bells and whistles included however they combine fair value with a robust all-round weather-resistant makeup that’s expeditious to maintain. If you’re like us, wishing to replace the ongoing preservation duties of a decaying wooden hut with a sporadic wash down when the dirt emerges, investigate Factor’s imperishable polypropylene manufacture. 8 x 11 feet generates oceans of storage room, frees up space in the garage and assists organising a wide spectrum of outdoorsy accessories including gardening equipment, patio furniture, kids toys and sporty stuff inside a fresh protective rot-free environment. Factor’s two-tone beige & taupe coloured fascia simulates a non glossy wood-grain finish in horizontal panelled styling, accentuating appealing charm to garden settings. Escaping the arduous tasks of annually preserving traditional huts together with exchanging rotting panels & roofing felt has unsurprisingly led to an upsurge in resin manufactures, on account of sidestepping conserving with the convenience of a hosepipe shower. 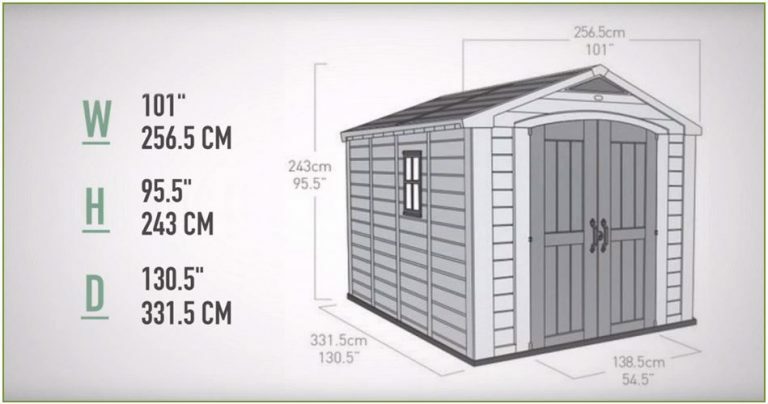 6 Sheds make up Factor’s competitively priced family, starting from 6 x 3 feet all the way up to these capacious 8 x 11 ft dimensions. Shed Sizes reveals Factor’s weatherproof storehouse competition. Compared with shiny surfaces, Factor’s matt beige tones exhibit an inconspicuous presentation, especially for a shed spanning these dimensions. The manufacturing procedure moulds the polypropylene into stocky walled sheets resembling a wooden construction embossed with a coarse grain texture. The walls arrive in panel formation. They deliver weather-encasement by interlocking with the border of the floor panel simultaneous to interlinking with adjacent wall sheets forming the surround; after-which they sturdily screw-secure onto the metal framework. Polypropylene constitutes Factor’s makeup meanwhile UV stabilising overcomes plastic’s inherent splitting and bleaching problems during exposure to sunburn. Unaffected by rot, polypropylene assures long-term weather-defence, requiring minimal maintenance & no future conserving. 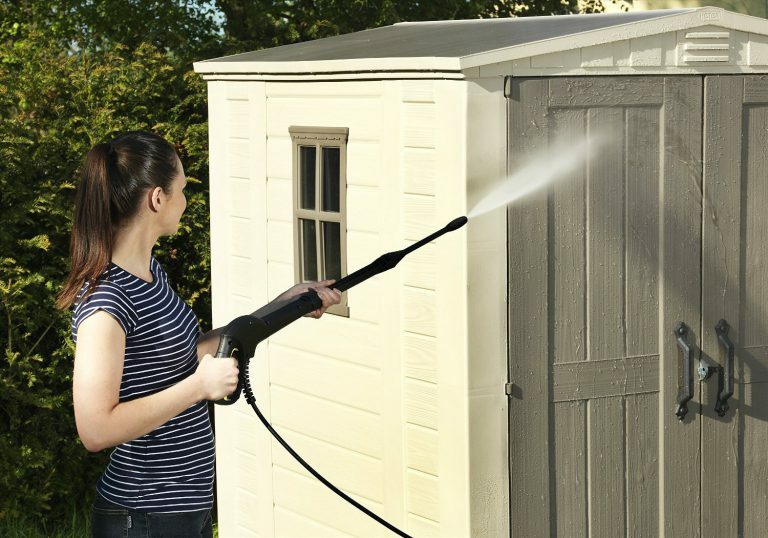 The fascia’s outer-surface cleans up super-quick delivering today’s popular vote amongst shed hunters, a few minutes pressure-hosing restores the shine lickety-split. Additionally, Factor’s polypropylene is 100% recyclable providing the environmentally friendly green thumbs up. One important message from reviews advises to refrain from leaning weighty items against the walls. Although wrapped around a metal frame, hefty storage can exceed the fascia’s limit & cause bulging. Consider circumventing this issue by installing stand-alone style shelving and using stacker boxes. Similar to the fascia albeit shaded dark grey, the roof’s polypropylene manufacture is molded into a stout weatherproof topping, impervious to rainwater and resistant to decay. Unlike roofing felt, a resin arrangement outsmarts re-roofing. The apex is produced in polypropylene sheet form & attaches to the metal frame across the roof expanse meanwhile supplementary strengthening is underpinned by steel trusses spanning the internal width producing a top capable of supporting heavy snowfall. Factor’s apex design comprises an adequately high incline to the peak, prevents puddles developing & conduces efficient drainage, enhanced by the roof overlapping the walls meanwhile reciprocates inside with gardener-friendly headroom height, that overcomes ducking down when walking around. A resin composition entails a future absent from the replacement projects associated with disintegrating roofing felt, rather, this imperishable manufacture continues-on unaffected by adverse weather & damp conditions. Factor’s built-in resin floors are rot-resistant, assuring long-term survival against damp environments meanwhile assist in maintaining a clean interior for storage protection, a valuable asset especially for a shed this size due to the amount of storage it’s able to accommodate. It’s rare to find a metal shed inclusive of an integrated floor, most require the installation of a wooden base which defeats the objective somewhat with regards to defeating decay. Similar to the walls & roof, the floor’s polypropylene manufacture is formed in sheets. Moulded into a beefy bed they interlink with adjoining floor panels in addition to interlocking with the walls. The elimination of a gap surrounding the base perimeter prohibits wind wafting debris and leaves inside, puddles appearing on the internal floor and pests gaining entry looking for shelter. 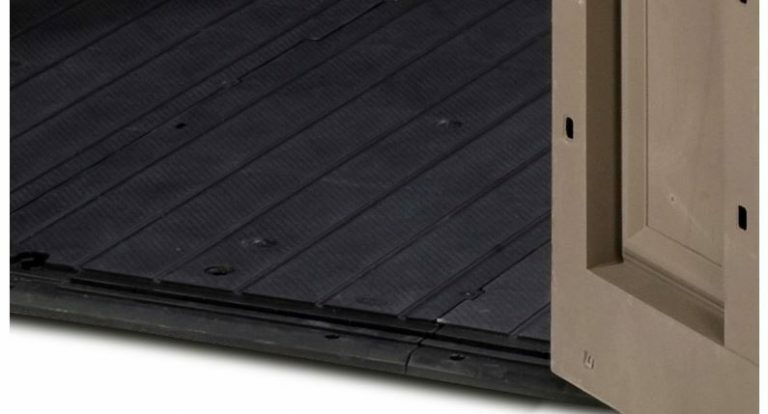 Factor floors are purposely toughened to endure the movements of tractor mowers, however, in order to survive such demanding stresses, it’s imperative the floor stations on a solid flat substrate. Anchor indentations provide the positions for grounding the shed, in order to increase wind resistance levels & stability. 8 ft wide by 11 ft deep equates to in excess of 80 square feet of storage space. Height-wise, it’s lofty. No banging your noodle nor any claustrophobic feelings either. Exceeding 2 metres internal height delivers plentiful storage solutions. These capacious dimensions will pretty much store most of our needs: A ride-on-mower, garden furniture, patio accessories, barbecue equipment, all the gardening tools, parking bikes, mobility scooter storage, long handled tools & ladders or maybe a huge potting shed, the list really is endless. A garage clear out that facilitates the most rapid of garden tidy-ups through broad access double doors. Kids toys scattering outdoors presents no problems here. 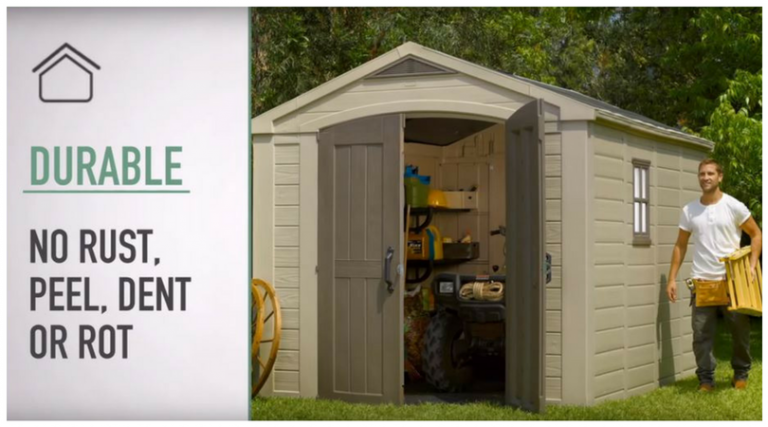 Included with this shed are 2 shelves for accommodating light items. Consider the alternative by installing tiered stand-alone self-assembly shelving to exploit Factor’s internal height, it’s surprising how much stuff is able to accommodate heading up towards the ceiling. A window in the wall accompanies the skylight in basking natural daylight inside meanwhile air-vents incorporated front & back eliminate yesteryear’s sweaty atmospheres by circulating fresh air around the interior. Wide robust double doors provide the easy route into Factor sheds, the broad entrance simplifies rolling in a mower & carting hefty storage in and out. Along with the appealing visual aspect of their door’s arch, this does increase entrance height a tad eliminating bending over during entry. Similar to the walls, the doors make-up comprises a chunky-walled, easily-cleaned polypropylene manufacture that withstands decay, molded to resemble a wooden entrance embracing fine details of textured grain running throughout. Although nothing too slick courtesy of Factor’s competitive edge, the doors incorporate decent sturdy handles making entry little effort. A built-in padlock clasp effectuates closure & locking up. If you’re wishing to escape the yearly upkeep demands of decaying wood, sorting peeling varnish, annually purchasing stain to preserve, not forgetting re-roofing problems, Factor’s modern design ditches traditional upkeep for an easier life. Factor’s composition is not susceptible to rust nor rot, neither does it succumb to future re-roofing. A wash down when the grime appears describes their convenience. Most people pressure-wash them down or use a soft brush in warm water with a squirt of light detergent, whereas we frequently click the shower adaptor into the hosepipe. A few minutes later, it’s back looking new again. The tip is to avoid using anything too abrasive, like wire-wool to prevent scratches appearing. #1 Priority before assembly is to make sure the shed’s foundations lay solid, level & higher than a floodplain to eliminate being immersed in water. Many ask a local tradesman to lay a concrete bed for a shed this size. It delivers a speedy assembly, a level base assures straightforward plumb panel alignment. Levelled ground delivers a perpendicular stance that prevents roof weights leaning to one side. Plumb door alignments functioning precise swings are streamlined from vertical architraves. Solid foundations are pivotal for the floor to endure long-term tractor stresses. Check the delivery for defects before constructing. 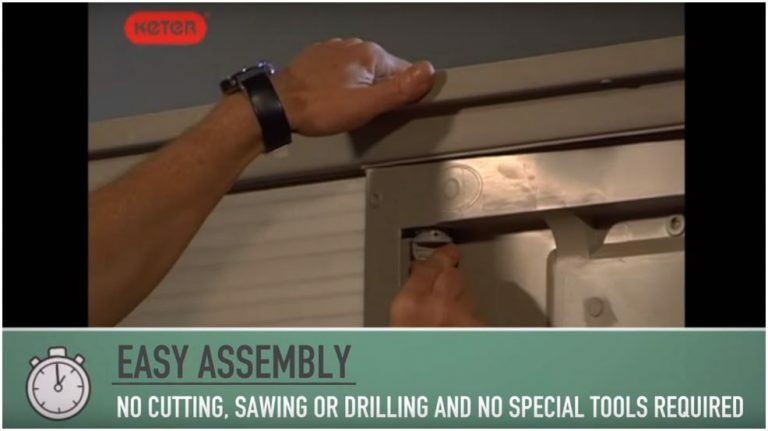 Prior to assembly, it’s beneficial to place all the parts in the same order as the instruction steps, thus saving time to accomplish a quick and efficient build. Choosing which side the window faces requires working out before constructing. Last job involves securing the base down onto solid ground below. Indentations regard the positions for driving in anchor bolts. Weather-resistant storehouse competition is trending stronger, many are choosing to move way from the hassles of conserving. A voluminous storage space presents with Factor’s 8 x 11 ft shed meanwhile a robust weatherproof manufacture, built-in floor & incorporated ventilation helps keep storage in fine fettle. A wide twin door entryway delivers straightforward access to heavy storage whilst stylish modern looks admirably accentuate garden backdrops. Okay, Factors refrain from furnishing their sheds with quality finishes, this is purposely done to remain competitive. They trumpet out low-maintenance whilst providing exceptional value for money. A good choice with stellar reviews! Hope Factor’s 11 footer helps with your large resin storage shed search. If you have any spacious storehouse queries, please ask in the box below. Happy to assist where I can. Please share Factor’s 11 footer. Thank you! Wow Simon, I have been in the market for a shed for a while. Being a single mom, it is all about finding the best deal and then being able to pay for it. But, you have given a wealth of information. I honestly did not think that there were so many factors to consider when purchasing a shed. 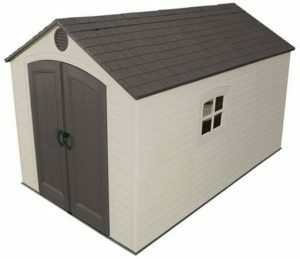 I really like the 8 X 11 shed, the first one you review. It would work perfect for me. Hi Matt’s Mom, Factor sheds provide great value for the buck. There are more stylish sheds out there but they do demand a much higher price whereas Factors stick within a budget delivering an inexpensive storage solution that matches competitors long term weather-resistance. These chunky imperishable yet recyclable fascia panels are not susceptible to rot disintegration meanwhile the entire manufacture is UV stabilised for armoury against the forces of sun rays bleaching and fracturing, so they’re designed weatherproof and able to maintain their looks courtesy of a once in a while light pressure wash. Factor storehouses range from a 6 x 3 footprint up to this sheds spacious 8 x 11 ft expanse that’s able to accommodate a wide range of outdoorsy gear meanwhile supporting the 8 ft roof stretch, steel trusses under-gird the structure where the roof panels fasten for snow support. Hi Simon, very informative article. I did not know they made sheds like this with resin. Will keep this in mind for my next shed. 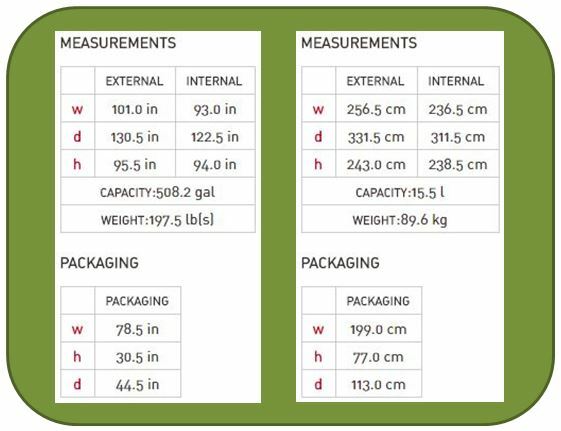 Thanks for stopping by to read about Factor’s large resin storage sheds, stretching 8 x 11 feet. Likewise, we too were oblivious to this type of composition until we looked out for a replacement to our deteriorating shed. Fed up with conserving rotting issues our attention turned towards a make-up that was immune from decay, to escape the hassles to be honest. Some of the new designs of quality plastic sheds are exhibiting stylish impressions, destined to enhance any home grounds. Inclusive of integrated heavy duty floors, ventilation, poly-carbonate windows and skylights however if the accompaniment of quality features such as stainless steel door hardware etc are on the agenda, then this marks up the price somewhat. It depends what one is willing to spend to accommodate outdoor storage. Factor sheds fit most people’s budgets, look fairly stylish, have a sturdy build quality and include the integrated features seen at the top of the market yet lack on some of their finishes to remain extremely competitive. Check out the reviews within the pricing section, Factor’s come across extremely favourable. Thank you for showing all of the details of these resin sheds. I use to always buy the metal sheds, but with children they get a lot of dents in them and the doors quit working. I have been interested in getting a new shed. I had not considered a resin shed before, but now I definitely am. Thank you so much. Thanks for dropping by to read about Factor’s large resin storage sheds spanning 8 x 11 feet. Metal shed skins are usually single skinned flimsy sheets that are prone to denting, I agree plus like you say the doors start to jam overtime due to their sliding mechanisms being affected by damp conditions. Another issue we contemplated regarding the metal variety was their lack of a built in floor, these are seldom seen on this style requesting you to fit a wooden one if the internal foundations aren’t particularly suited, obviously this ends up as wood which defeats the object somewhat regarding damp & rot. We’re happy with ours, cleaning’s swift and a cinch compared to traditional methods of varnish plus the roof is fab, being immune from weather-rot. 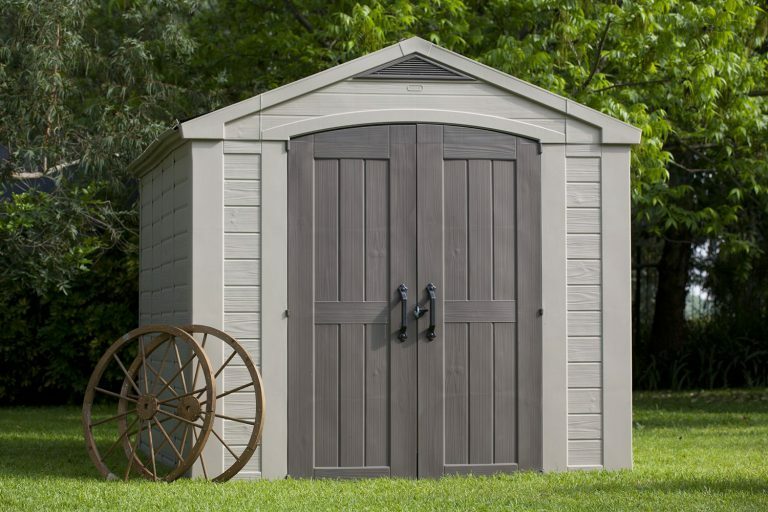 6 sheds complete the Factor Range, this model’s the largest however they are very competitively priced with sturdy build quality if you’re not to bothered about sparkly finishing touches. I didnt know they make such a big sheds from plastic that is resistable to water. It is so big it looks like we can move the grandchildrens in their new room. however the fact that you actually dont need any special tools and they are not are required, made the choice for us. 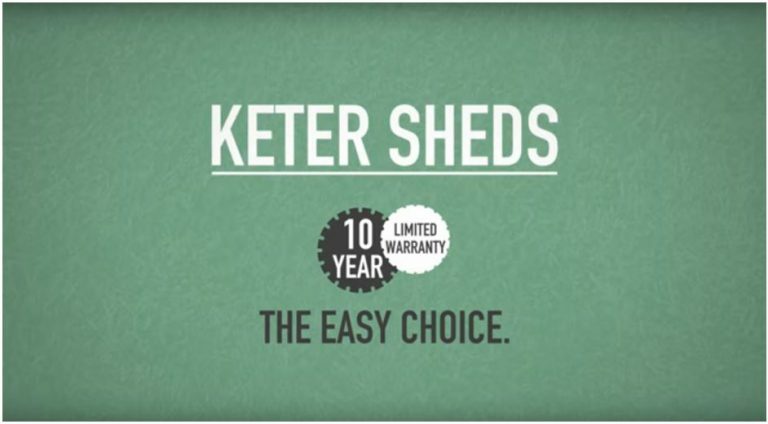 Thanks for dropping by and reading about Keter’s Factor 8 x 11 ft large resin storage sheds. Yeah, this is the largest shed in the Factor range, a whopping 8 x 11 ft which is able to accommodate one heck of a large amount of storage, offering a home and garage clear-out with ease regarding outdoor gear. 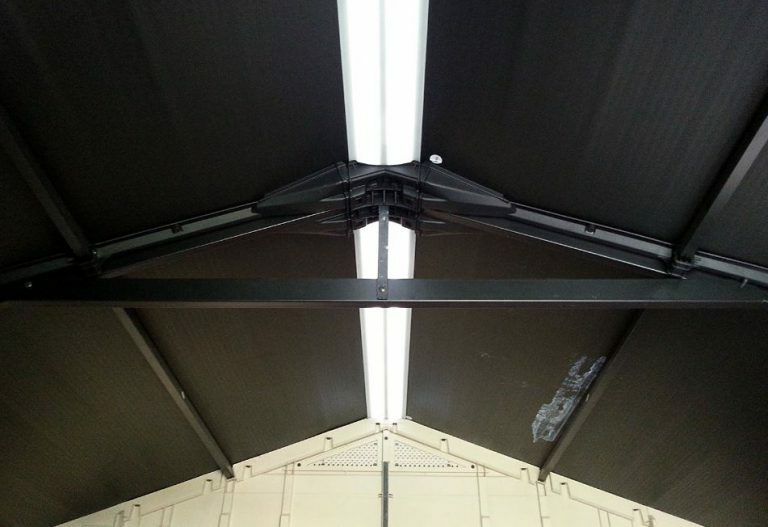 All quality plastic sheds seem to be manufactured with emphasis on ease of installation nowadays. The crucial part however is to prepare solid level foundations for the shed to sit on. I just wish the sales sites would mention this stipulation. Solid level foundations are the one step process in accomplishing the perfect resin shed construction. All the panels and doors line up with ease, the floor survives the pressures and the construction has a vertical stance. Yes, household tools construct Factor sheds, 2 people are required for assembly, one supporting whilst the other secures with screws. A case of following and implementing what’s shown in the construction steps. 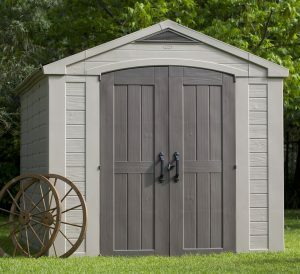 Which shed should I buy the Keter Apex 8 x 11ft or the Oaklands 7.5 x 9ft shed? 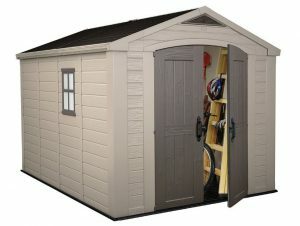 What shed would you recommend and why? We purchased a smaller Keter Factor shed a few years ago now, before these new ranges like the Oakland design entered onto the market. This was a replacement for our last wooden shed which decayed away. We’ve been very happy with the qualities Factor sheds offer and their easy clean ability without any no going maintenance nor deterioration from weather attack to deal with. If we were to choose a shed today however I think we’d probably go for the Oakland. They are new to the market, a much more stylish design due to this new Duotech manufacture plus they have more quality finishing touches too. Having said that, Factor sheds are more competitive if budget is of primary concern. To answer your question, I would choose a Factor shed if budget was my concern however if budget isn’t high on the agenda I would opt for the Oakland shed. I’m a big fan of sheds. 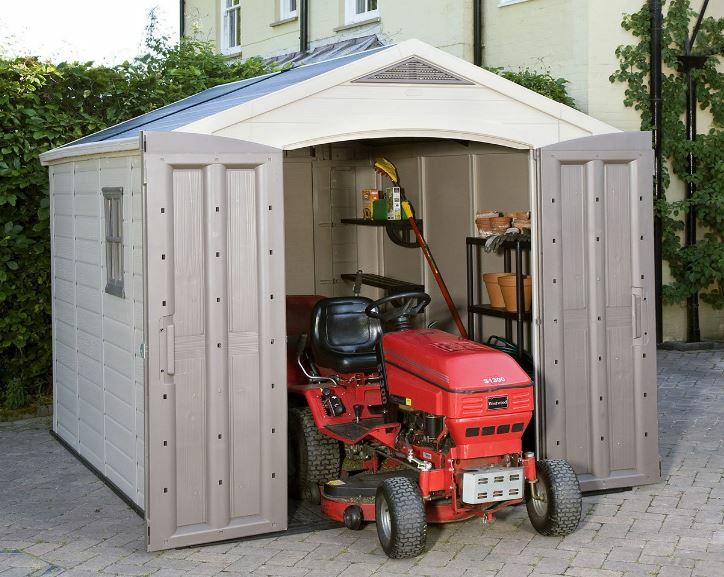 All sheds are so useful for storage, projects, tools, and pets. 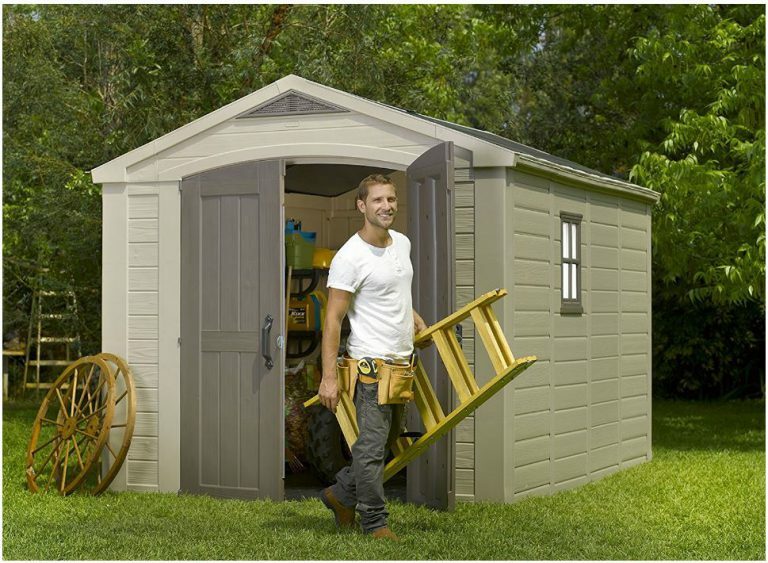 Every man should have a shed and a lot of women could use one too. I always have many art and craft project going which need a lot of storage and work space. These resin sheds would be ideal because they are so clean and neat looking. Most of the old tin sheds are just too dirty and rusty to be of use to me. 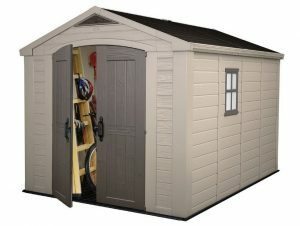 The only thing I would add to my shed wish list would be that it was made out of recycled plastics instead of new resin. Thanks for making me aware of this option. 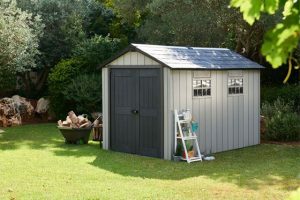 Space indoors is at such a premium nowadays, a shed can serve an important role to harbor all the outdoor gear making more room indoors and as you say, a great space for projects too. Sheds are starting to go through a similar process as dustbins transformed into, using plastic wheelie bins rather than the old rusting metal variety. Resin is easy to keep clean by virtue of a pressure hose in minutes against the ongoing maintenance hassles wood and metal sheds succumb to. These sheds are manufactured from polypropylene resin which is 100% recyclable so there’s peace of mind that this resin will be recycled into other products at the end of their day. Yeah, I’m really enjoying myself reviewing all these low maintenance storage sheds. All these sheds are manufactured from weather-resistant resin that’s durable and waterproof. Resin doesn’t rot or decay so there’s no deterioration to worry about. The beauty is, they’re so easy to clean. I just hose ours down now and again and the jobs done. Yes, on each review I have a link to a page where all sheds are in range order and another link where sheds are in size order from the smallest going up in size. This is just a passion I have. After going through a long series of headaches with my last wooden shed we opted to change and try a resin style. Best thing we’ve done for outdoors, they’re hassle-free. More time to spend in the garden – ha! Simon your website is very informative. I have been looking for an outdoor shed for a rental property. this looks like it has potential to be what I’m looking for. The floor feature appears to add needed strength to a resin building. The rafters appear to be simple to assemble and install. All in all your review of the buildings seems thorough and concise. Thanks for the research and report. Yeah, this is a good sized resin shed. 8ft x 11ft deep. This will fit in a lot of storage for your rental property. Many opt for the free standing shelves too to take your storage options up towards the ceiling. You’ll be surprised what you can fit in a shed this size. Yeah, the floor is built-in and does support strength for the facility. Always make sure you stand the shed on solid level foundations as this is every plastic sheds priority which will lead to a quick efficient build and the floor will serve as heavy duty. Yes they are quite an easy construction, they take 2 people to build and you can put the shed together with household tools. This shed looks amazing! The size of it is incredible if it can hold a riding lawn mower. 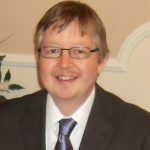 The idea of maintenance free upkeep is a real important feature. I have had problems with some of the resin products developing mold on the outside over several years. I did not see any mention of this issue. Can you tell me if this is something that regular upkeep will prevent. How often would you need to power wash the outside and would you use any kind of chemical it help keep the mold away? It looks pretty basic to assemble. 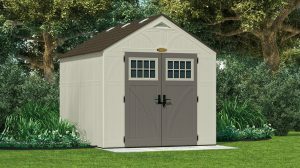 Would someone with no skills at all be able to construct this shed? Thank yo for the informative post. Yeah, sheds don’t come much larger than 8ft x 11ft, this will hold a whole host of storage, options are pretty much endless here. If you have room to harbour this size – Fantastic, clear the garage out. I never describe anything as maintenance-free as there’s always a cleaning job with whatever you purchase, so I prefer to describe these as virtually maintenance-free or low maintenance. Upkeep depends on your surroundings really, are you in open ground where washing down is infrequent or surrounded by trees where upkeep is more regular. Mould only requires washing off once seen before it starts to establish really. If you get ingrained dirt that just won’t budge, a couple of cups of white vinegar into a hot soapy bucket and wash down with a soft brush or cloth usually does the trick. White vinegar is powerful stuff for removing all sorts of ingrained grime, I use it all the time. The shed requires 2 people to assemble, there are a lot of screws so don’t be daunted. Just go through the instructions one step at a time. If it takes a day for many of us inexperienced DIYers, so what! You’ll have a delightful shed fit for a whole host of storage solutions at the end of the build. Make sure it sits on solid level foundations – this is imperative for any plastic shed as all the panels will line up correctly during assembly and the floor will serve as heavy duty for years to come. 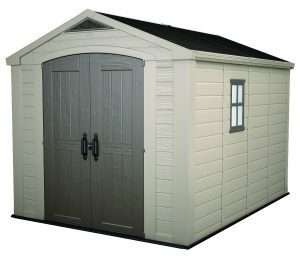 Hi Simon, Your information is clear and easy to follow and there is no doubt that these sheds would be a good purchase. I am sure there are complaints about putting them together due to the fact that people tend to think oh well I will just set it up here without insure it is a solid level spot that they try to use. My husband tends to try everything before reading directions and it makes me crazy. when and if I get one like this he WILL be reading directions first. Ha!! Your husband sound like the majority of us blokes. You are right, the proper way is to prepare first which really doesn’t take long as far as getting all the parts out and placing them in order according to the instruction step by step guide. The whole job does go a lot smoother and quicker when you are organised especially for a shed this size as there are a lot of screws – This is a but daunting for a lot of DIYers. Look at it this way, for half a days assembly you will achieve a well built shed that will last years without any maintenance problems. Worth putting the effort in I say. Yes, the shed base is very important. It’s imperative the foundations are solid and level which will lead to all the panels lining up correctly during assembly and the longevity of a hard wearing floor will be accomplished. I have a large wooden shed now. It does require some maintenance on the outside. Painting and cleaning. The large resin storage shed looks like it would be a great replacement in the future when my current shed needs replacing. I just wish that you could put up more shelving as I have all of my garden tools hanging on a rack. Do you think one of the resin tool racks would be a good addition for the long handled tools, they do make one for the corner. I like the idea of a window, it does let in enough light to let you see without a flashlight. I put one in my current shed. Yeah, those plastic or metal free standing shelves are ideal and I know the corner one you mention too. The inability to screwing into plastic is the only problem with the resin style shed but the problem can be overcome by using the stand-alone variety. Oh John, don’t get me going on maintenance (ha!). I have been through all these maintenance problems, restaining, trying to replace a felted roof and tacking into rotten old surrounding wood – Nightmare. I’m sure it’s the reason resin is proving ever so popular today, people simply don’t have the time or don’t want the work.